This entry was posted on February 1, 2011, 11:54 am and is filed under Research, Technology. You can follow any responses to this entry through RSS 2.0. Both comments and pings are currently closed. Interesting post, Brian. One thing I’m wondering: How much of what a viewer sees in a high-res reproduction is informed by what s/he has seen in real life? 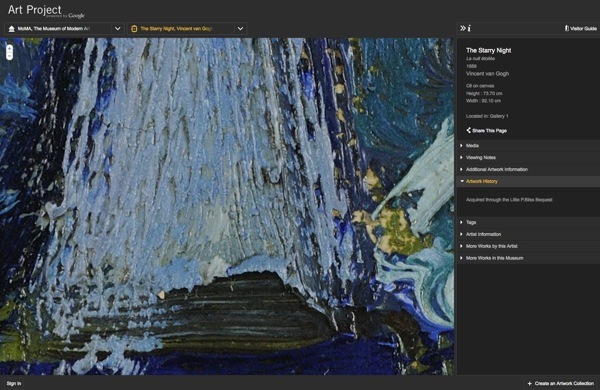 In other words, how much can you appreciate what a Google Art reproduction tells you about the thickness of paint, say, or the texture of brush strokes if you haven’t seen those things on an actual canvas in front of you? Tangentially related anecdote from the world of textual scholarship: A couple of years ago, I wrote about a scholar who was working with Mary Shelley’s “Frankenstein” notebooks. He was not at all averse to high-res digital images of manuscripts; he used them and liked how they expanded access to manuscripts that many people couldn’t travel to see. But he also said there were some questions he was only able to settle by laying eyes on the original manuscript. The example I remember was an ink blot that could have been a punctuation mark or could have been bleed-through from the other side of the page. He had to go look at the actual notebook pages to figure out which it was. Thanks for your comment, Jennifer. I think you’re right that our understanding of the high-res image must be shaped by what we’ve seen in real life. 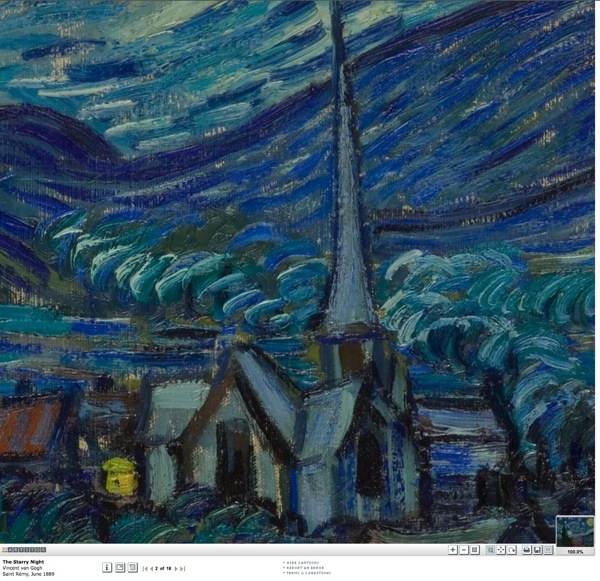 I don’t know if we have to have had the experience of seeing a Van Gogh in person, however, so much as having seen them on, as you put it, “an actual canvas.” The specificity of the canvas perhaps doesn’t matter as much as the knowledge of how oils move against a canvas and one another. That being said, as someone who lived in The Netherlands, I will begrudge no man or woman the opportunity to see as many Van Goghs as possible. I had a similar experience in need to see the original documents when working on one of Hemingway’s manuscripts. To lessen the wear and tear on the notebooks, the JFK provides researchers with photocopies. In most cases, that’s all that is necessary to do one’s work, but one page of A Farewell to Arms was so crowded, that only looking at the original was able to resolve the question for me. -maybe less about mechanical reproduction and more about the figments of art or pigments- Benjamin’s descriptions of the streets of Paris meets Klee’s views of paint.